Progress was seen on the renovation of the signal box this weekend when the carpenter temporarily removed the boards to reveal the work that has been going on over the past few months. The Friends of Hednesford Park are delighted to have secured funding for restoring this iconic and historic Hednesford Signal Box. It is a credit to all involved to see it not only preserved as part the towns history but also now having a vital future role as widely used community asset. Staffordshire County Council and Cannock Chase Council originally found the funds to save the box from demolition when the signal boxes were being decommissioned and centralised in August 2013. Signal Box No.1 moved to its new home in Hednesford Park in February 2014. 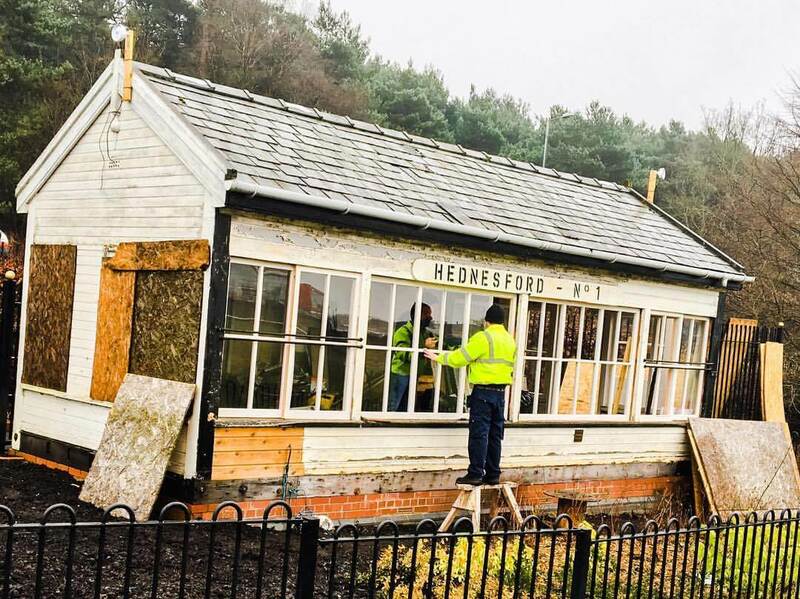 The Friends of Hednesford Park secured a 2-year funding project to renovate the Signal Box to become an Educational Hub. The fund was provided by Staffordshire Public Health Commissioning Prospectus, ‘A Partnership Approach to Improving Health and Wellbeing Outcomes’ The training and activities part of the project has enabled many vulnerable adults in our community to become healthy and active volunteers, they have made a significant and positive contribution to our community and planted the new formal garden at the Hednesford War Memorial. When renovated the Signal Box will be in constant use for courses, training, supporting the Forest School program for local schools, and will be opened during events. The public will be able to see how Signal Boxes used to work and how important this and its two sister boxes were in our local heritage and the development of our town.